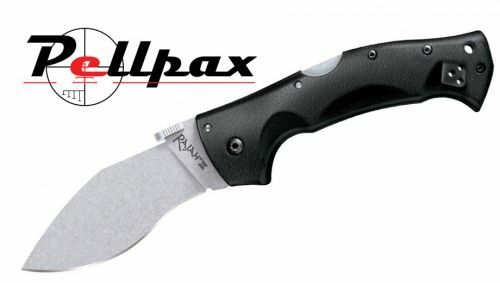 The Rajah III knife by Cold Steel is the more compact version of it's bigger brother. Fitted with a pocket/belt clip for easy transport this is ideal for any busy individual. The blade, crafted from BD1 stainless steel, has been bead blast finished to give it that high quality look and professional finish. It's razor sharp edge follows to a thin needle point allowing it to slash, cut and pierce tough materials. The Tri-Ad lock and the 4mm thick blade help reinforce this powerful blade during tough or demanding jobs. The Grivory handle has 3 effects. It makes the knife look very high quality and ties it together neatly. It also provides a solid grip so you can use your knife even when conditions get bad and finally you can achieve high levels of accuracy without compromising the comfort. Available in a plain cutting edge which is ideal for slicing or a serrated cutting edge for those heavier cutting jobs. Add this item to your basket & spend an extra £398.01 to apply for finance.